Tree allows you to sort nodes on the client side. Note, along with the parent nodes, child nodes are sorted as well. Data is sorted as strings and by levels, starting from the latest nesting level. Sorting in Tree can be invoked by calling the sort method. The method can be called on some event or action, i.e. button click or page load. If you want to apply a custom sorting behavior, you should define the related logic in a function and invoke this function in the sort method. 0 - the order of both objects doesn't change. Note, Tree sorts data by levels starting from the latest nesting level, i.e. 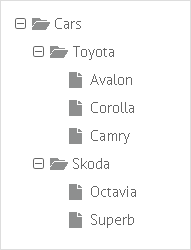 at first car models of each maker are sorted then car makers themselves.